Young and ambitious, Louisiana's Bobby Jindal lands on the GOP VP shortlist. TIM MUELLER/AP PHOTO Bobby Jindal takes questions about a possible vice presidential nod. It’s rare these days for a politician to garner a 77 percent approval rating, but Louisiana’s new governor, 37-year-old Indian-American Bobby Jindal, has made a brief yet storied career of defying expectations. Jindal, or “Bobby” to his constituents, received this massive bipartisan support in an April Southern Media and Opinion Research poll as his first 100 days in office ended. In the run-up to his landslide victory last year, the media celebrated Jindal’s impressive and precocious record: a Rhodes Scholar at 22, Louisiana secretary of health and hospitals at 24, Republican nominee for governor at 32, Congressman at 33. When he became governor, they were effusive. It seemed glorious that a Southern state could elect this dark-skinned man, so much so that the news reverberated globally; people in the Jindal family village in India were ecstatic, even though Bobby barely knows them. Such widespread and early popularity–although it took a recent hit over anger at a proposed pay hike for state legislators–indicates that Jindal’s base is broad enough to encompass Louisiana’s many disparate factions, from racist David Duke backers to liberal Democrats, who seemingly look past Jindal’s deeply conservative politics. Never heard of Bobby Jindal? Then pay attention. There’s a good chance he’ll be John McCain’s vice presidential pick. Commentators on the right, including Rush Limbaugh, began touting Jindal as vice presidential material just days after the governor’s inauguration. Limbaugh sees Jindal as the “next Ronald Reagan,” conservative enough to counter McCain’s purported liberalism and charismatic enough to win over Democrats. In a May 5 New York Times column, neocon William Kristol described four McCain staffers’ excitement about Jindal while extolling Jindal’s youth, his “real accomplishments” and his “strong reformist streak.” McCain met with Jindal, Florida Governor Charlie Crist and former rival Mitt Romney over the Memorial Day weekend in what was widely considered a first round of veep vetting. Perhaps most appealing for Republicans is the widespread support Jindal won from lifelong Democrats before and after his election. (A common Democratic bumper sticker in Louisiana reads Proud to Be a Bobbycrat.) Even feminists and healthcare advocates have expressed admiration for him, although as health secretary under Republican Governor Mike Foster, Jindal presided over the shrinking of Medicaid coverage and the beginning of the privatization of Louisiana’s free hospitals. Nonetheless, his Democratic successor as health secretary, David Hood, has nothing but praise for Jindal, calling him “the best secretary of DHH that I have seen in thirty years in state government.” Hood says that Jindal was organized, able to generate excitement among staff and had long-term vision. What Brylski and Hood repeatedly point to is the widely held perception that Jindal gets things done. Hood calls him the smartest person he knows, and Brylski says she’s willing to lose on her issues if it means that someone will be able to get the state moving again. Perhaps because the media have fixated on Jindal’s image, rapid rise and sweeping popularity, they have left his voting and policy records largely unexamined. Countless articles have sung the praises of this “wunderkind”–who changed his name from Piyush to Bobby (he was a fan of the youngest boy on The Brady Bunch) and converted from Hinduism to Catholicism–yet few have delved into the “whip smart” governor’s ideology. In fact, postpartisan gloss aside, whether in Louisiana politics or in Congress, Jindal has stood firmly with the religious right, has never wavered from the privatization mantra of the GOP and has been in lockstep with the neocons on foreign policy. Healthcare is a good place to begin. Louisiana had a single-payer system, known as charity hospitals, which more or less had provided everyone with access to free healthcare since 1736, making it the second-oldest public hospital system in the country. Under Governor Foster, Jindal landed his first major post, in 1996, running the only single-payer health system in the country. As health secretary, Jindal immediately set to work reining in spending and beating back the large bureaucracy that had bogged down the department for years. Brad Ott, a healthcare activist who dedicated his life to strengthening the charity hospital system after it saved his life from a stroke, points out that the harm Jindal could do to the charity system began to manifest during his term as health secretary. In 1997, while Jindal was running the agency, the Louisiana State University hospital system was directed to take over charity, and although Jindal’s day-to-day role in the takeover is unclear, Ott says, “Since it did happen during his watch, he obviously did sign off on it.” Ott believes that Jindal narrowly lost to Kathleen Blanco in his first run for governor because “Blanco ran commercials which spotlighted Jindal’s 1996-98 DHH tenure, which had attempted to close several rural charity hospitals, notably Lallie Kemp in Independence.” In Blanco’s commercial, Kemp’s medical director warned that if Jindal was elected, voters could expect the dissolution of the charity hospital system. Jindal also initiated cuts to the healthcare system that made it much harder for doctors to treat poor patients. From reducing Medicaid payments made to facilities that care for the mentally ill to laying off hundreds of mental health workers to denying certain prescription drugs to poor patients, Jindal’s cuts were swift–and the results predictable. In 2000, shortly after Jindal’s term ended, the Louisiana State Medical Society surveyed more than 600 doctors. Its report showed that 37 percent of the doctors said they were treating far fewer Medicaid patients than they were two years earlier. A further 37 percent said they had stopped accepting any new Medicaid patients. As governor, Jindal appointed Alan Levine as health secretary. A Floridian and a former healthcare adviser to Jeb Bush, Levine had presided over Broward Health, one of the country’s largest public health systems. In 2006 Levine was at the helm of the Florida Agency for Healthcare Administration, where he was the chief architect of Governor Bush’s contentious plan to privatize Medicaid at Broward. Lawsuits were filed against Florida by Broward Medicaid beneficiaries in the post-privatization period, and an attorney at Legal Aid recently told the South Florida Sun-Sentinel, “the Medicaid reform program has been imposed on poor and disabled people, and they are not getting the medical care and rights the law promises them.” Should Levine, under Jindal, bring such privatization schemes to Louisiana, which is currently ranked second to last among all states for healthcare, the outlook for patients is not rosy. While many have celebrated Jindal’s election as a victory for people of color in the South, a closer look at his relationship with the black community reveals otherwise. Jindal has been accused of snubbing NAACP invitations and was given an F rating on issues of race for his policy choices and political stances. Perhaps most telling was his response to the Jena Six, the case that captured the nation’s attention when a local District Attorney charged six black high school students with second-degree attempted murder for their part in a schoolyard fight with a white youth who had made racial taunts related to nooses found hanging from a tree on school property. As tens of thousands of mostly African-American protesters from all over the country marched through Jena’s streets on September 20, 2007, gubernatorial candidate Jindal told a group of students at LSU-Shreveport that the protesters were “outside agitators” there to “cause problems.” Jindal lost the town of Jena to Blanco in 2003, 61 percent to 39 percent. Not surprisingly, after his stand with the white community, Jindal received the endorsement of controversial DA Reed Walters, the mayor of Jena and the Jena police chief. Jindal comfortably won the city of Jena by 55 percent in the 2007 election. 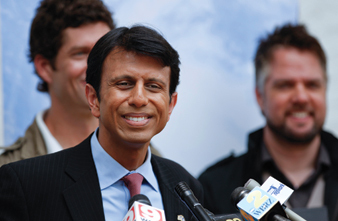 While the South Asian community in Louisiana is small, Jindal has never publicly drawn on his roots or ethnic heritage. In fact, he has little affinity with his ethnicity; one often hears him positioning himself as the all-American kid. In his victory speech on election day, he mentioned that his parents came to Louisiana to find the American Dream and then chanted, “Go Tigers! Beat Auburn!” While no one would deny Jindal the space to cheer for his favorite team, he rarely honors his roots, making only the odd mention of himself as “the son of Indian immigrants.” Jindal plays a very different game from that of Obama, who has talked openly about race and his father’s immigrant experience. Another elected South Asian, Jay Goyal, a State Representative in the Ohio Legislature, says that it is hard to get elected if voters think you might have an allegiance to another country. Yet Goyal thinks Jindal’s popularity in Louisiana stems directly from his religious brand of politics; Jindal’s votes and policy proposals cement his alliance with Christian conservatives. Jindal’s slim record as a Congressman from 2005 to 2008 is a window into this staunch conservatism. In that time he missed 427 of 2,398 votes (18 percent); GovTrack.us, the nonpartisan website that tracks elected officials’ participation, gave Congressman Jindal a rating of “Exceedingly Poor relative to peers.” Nevertheless, Jindal’s religious bias and radical-right politics are evident in the votes he did cast. He voted no on a bill to amend the federal definition of a hate crime to include sexual orientation and gender identity. He also voted against reauthorizing and expanding the State Children’s Health Insurance Program (S-CHIP). Not surprisingly, he voted against stem-cell research. He has been an advocate of teaching creationism over evolution and has passionately spoken up for this cause. Jindal has voted against a woman’s right to an abortion every chance he has had, including a vote against allowing overseas military personnel the ability to use their own money to obtain abortion services in overseas military hospitals. He also voted for a bill that would require abortion providers to tell patients that an unborn fetus experiences pain during an abortion. Jindal has also been an outspoken advocate for the National Rifle Association. In fact, he recently received an NRA award for his “service to the Second Amendment.” Jindal won the support of the extremist white element in Louisiana when he sponsored legislation to ensure that no guns are confiscated during times of emergency, despite evidence of hate crimes committed against African-Americans by whites acting as local militia in the aftermath of Hurricane Katrina. On matters of foreign policy he has been equally conservative, winning vice presidential approval from Newt Gingrich and William Kristol. While in the House, Jindal joined the majority to deny aid to Palestinians in the occupied territories after they elected members of Hamas. But he went further than his peers, calling on the European Union to follow the United States’ “iron-clad position” of cutting off Hamas and the Palestinian people. In the Bush Administration’s “war on terror,” Jindal is a loyalist. He mimics Bush’s tough-on-terrorism line, speaking out often about “Islamic extremists” bent on “the total destruction of Western Civilization.” He voted against a mandate that would have required the Defense Secretary to transfer prisoners out of Guantánamo and against a measure that would have created a mandatory rest period for troops between deployments to Iraq. So, given that his policy agenda and value system are far outside the mainstream, why is Bobby Jindal so popular? If he has consistently voted against core Democratic values and issues, how does he appeal to liberals? Jindal–who may be one of the best gamesmen in the country–is a nimble, effective politician who speaks convincingly about inclusion. When the results don’t quite match the rhetoric, he shifts persuasively to discussing his record of political victories and improvements to government. Most important, he has a reputation for producing results–no matter what those results might be. Given Louisiana’s harsh economic landscape and its conservative tilt, many Democrats there seem willing to sacrifice an unattainable agenda for these immediate results. They are tired of working to advance policy initiatives that get bogged down in partisan bickering and thus rarely come to fruition. In his short tenure, Jindal has proven himself an efficient statesman, and while he is no progressive, his conservatism wears the face of a person simply fighting for change. Louisianans of all political stripes are desperate for change. For Republicans, Jindal produces the right results. Should McCain need to connect with conservatives and the religious right, Bobby Jindal is certainly his man. And with the “racially transcendent,” change-talking Barack Obama the presumptive Democratic nominee for President, the odds of a countervailing McCain/Jindal ticket are looking good.